Paintless dent removal, also known as PDR, is a process of repairing damage to your automobile that involves no paint or body filler. This is an ideal solution to any damage done to the body of your car because the dent is fixed without affecting the manufacturers paint on your vehicle. Another reason this is advantageous is because our paintless dent removal service is completely mobile. That means most paintless dent repairs can be done wherever you are in Orlando as well as the surrounding areas of Orange County and Seminole County. Learn more about our Mobile Dent Repair Service. In short, the Paintless Dent Removal process requires the use of special tools that literally push the dent out of the metal. Obviously this explanation grossly oversimplifies the process, the full process involves expertise, attention to detail and a series of pushing and tapping the dent out of the body of your car. 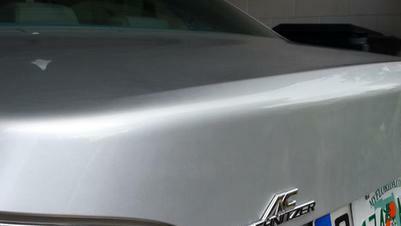 The process of paintless dent removal allows us to return to you a finished product which is perfectly smooth. Usually your car is returned to the showroom quality it displayed prior to the dent and there is no evidence of the previous damage. Reviewing the current state of your automobile to gain a clear understanding of all the work that’s required or desired. Identifying where the damage is on your vehicle. The physical location of the dent is significant in determining if paintless dent repair will be effective and what the process will entail. Determining, based on where the dent is and the type of vehicle, if the area will be accessible to our tools and what parts we will need to displace to ensure a clear path. In many cases with paintless dent repair in Orlando or wherever you are located, it’s necessary to get to the underside of the panel to effectively push and massage the dented material back into shape. Measuring the length, depth and severity of the dent to determine which tools and methods to use to ensure the process of paintless dent repair is successful and as efficient as possible. 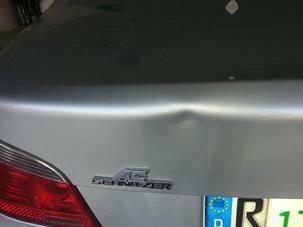 Determining the extent of the damage to the affected area and whether or not the original paint in and around the dent is scratched, smudged or broken. As aforementioned, there are some dents that can only be fixed using conventional repair methods. However, the vast majority of cases are eligible for the paintless process and yield near-perfect final results. Yes, there are several paintless dent repair companies in and around Orlando but you shouldn’t trust your car to just anyone! Request the experience and customer service you deserve - click or call to contact Orange County Paintless Dent Company today for a free quote! If you have questions about paintless dent repair, check out our FAQ page or call us at 407-924-2507. Carefully removing any parts, pieces or panels that stand in the way of accessing the specific area that needs to be fixed. It’s necessary to ensure that nothing impedes the technician’s ability to see the affected area and reach it with the appropriate tools. Determining the exact position to place the tool in order to begin the process of manipulating the dent without damaging or disturbing the surrounding area. Often times, special methods are used in order to get a clear look at the place where the work is being performed. Placing the dent removal tool on the backside of the dented area and slowly applying pressure while carefully massaging the material back to its original position. Orlando and the surrounding regions are home to Orange County Paintless Dent Compay, your local source for fast and reliable paintless dent removal. While there’s a time and place for visiting a traditional auto shop in the case of a major accident or more catastrophic body damage, repairs to superficial dents, dings, scratches and blemishes can be easily fixed through our paintless repair process. Not only can we come to your residence, your office or even a restaurant while you dine to fix your vehicle, but the price of paintless dent repair is usually two-thirds of what the same repair would cost you at a body shop! - No rental car fees. Our speedy process eliminates the need for bothering your neighbor for a ride or having to pay for a temporary method of transportation. - No insurance deductible. We’ll keep the costs down not only on your repair, but also without impacting future driver insurance rates that can skyrocket as a result of even a minor incident. - No hassle, just high-quality service and repairs. It’s a win-win situation. Typically, we can repair dents, dings, creases and hail damage the same day. While smaller dents can be fixed by the paintless dent removal process within the hour, and some collision damage can be fixed with the PDR process, normally, collision repairs should go to a body shop for repairs. If you aren’t sure if paintless dent repair will work for you, contact us for a free assessment. Cleaning and polishing the exterior as the dented area is being restored to ensure a seamless repair that mirrors the finish of the rest of the vehicle. Replacing and returning all of the parts, lights, wiring or anything else that was removed or displaced during the repair to its correct position. When you choose paintless car dent repair by Orange County Paintless Dent Company, you can be sure you’re receiving service from highly trained and experienced technicians dedicated to your complete satisfaction. Thanks to the quality of our non-invasive methods and expertise of our team, we’re able to deliver amazing results fast and typically at a lower cost than sending your vehicle to the body shop. Most dent removals can be accomplished the same day and often in under an hour. We’ll even leave you with detailed instructions on how to best care for your car, truck or transport following services.